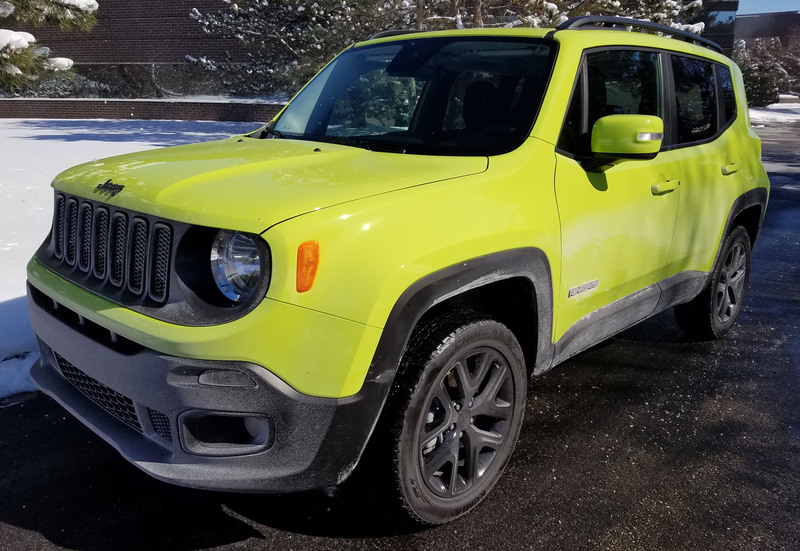 Young folks wanting a Jeep for its looks and rugged personality, but who are on an entry-level budget and prefer comfort to mudding ability can find refuge in Jeep’s Renegade. This is a multi-trim model that ranges from $20 grand, including delivery, up to $30 grand for an off-roading version. Renegade is built on the Fiat 500X chassis in Italy, so quite a ways from Toledo, Ohio, the spiritual home of Jeep and its predecessor, Willys. But Renegade, despite being a downsized Jeep offers much more civility for daily driving, plus that low-ball entry price. Mine was a near fluorescent neon green (dubbed Bright Hypergreen) that seemed to glow in the parking lot like one of those radioactive bars that Homer Simpson gets stuck in his pocket. 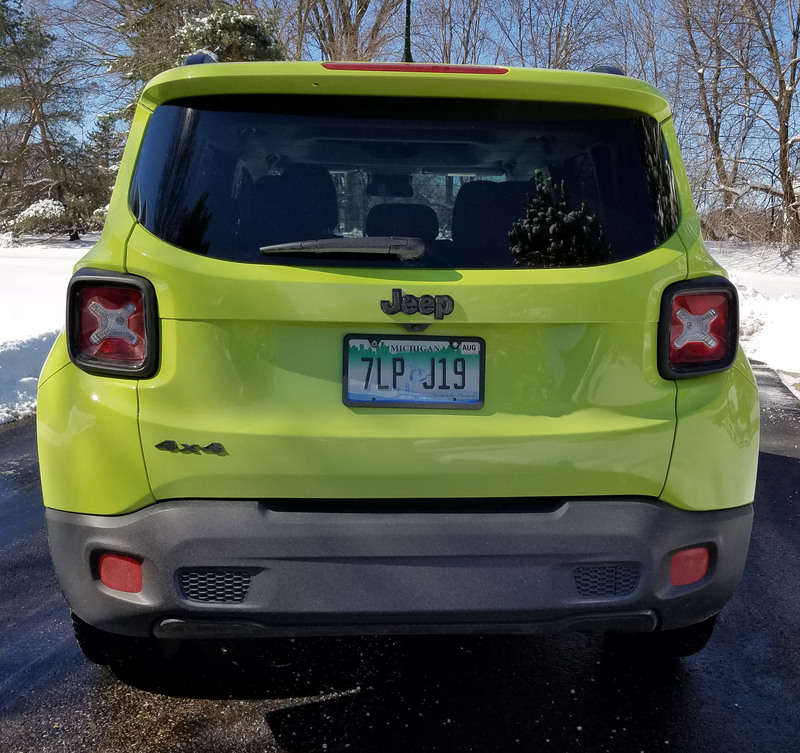 Folks at the office taunted me about the color, but it turns out to be quite fun to drive around in such a glow stick and was incredibly easy to find in any parking lot. It’s the civility that strikes me most about Renegade. Ride is downright comfortable and tame, not the usual don’t-come-knocking-when-this-baby-is-rockin’ ride of its original off-roading cousin, the roughhewn Wrangler. 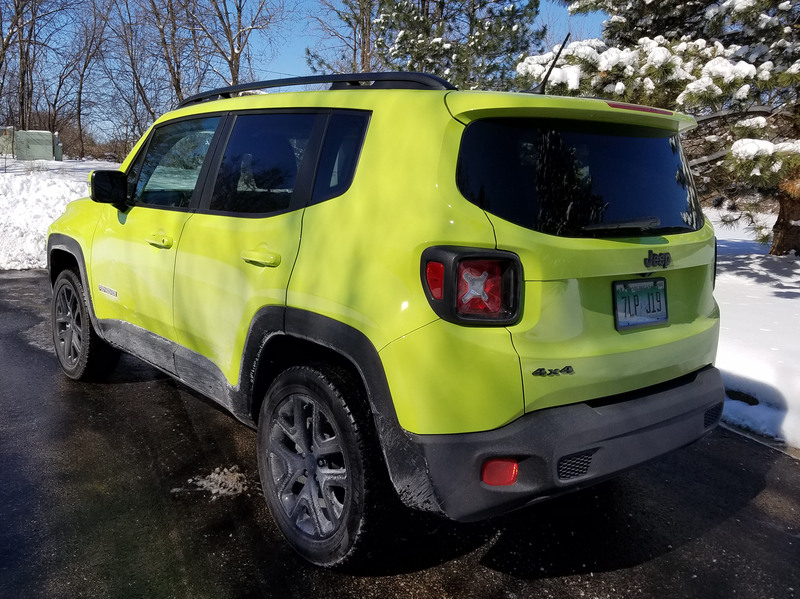 Even on Wisconsin’s crumbling roads the Renegade delivered a relatively well-controlled an smooth ride, no small accomplishment for a vehicle riding on just a 101.2-inch wheelbase. Handling is quick and easy too, something you’d expect in a petit Jeep. Small folks along with the seriously musclebound could easily slip a Renegade into tight city parking spots. Plus this comes with adjustable 4-wheel-drive. Settings at the bottom of the center stack allow you to put it in Automatic mode and let its computer do the thinking, or set the Jeep for running in Sand, Snow, or Mud. I left it in Automatic most of the time. Also standard here is traction control, electronic roll mitigation and stability control. Braking is quite good from four-wheel discs, and the AWD kicked in when roads were wet and slippery, keeping me from spinning the tires, often easy to do when accelerating aggressively. All that was aided by the standard 6-speed manual transmission that allows a driver to ease away from a slippery stop. Shifting was smooth too. Power is on the mild side with the Fiat-built turbocharged 1.4-liter MultiAir I4 engine. It creates 160 horsepower and 184 lb.-ft. of torque. That sounds solid, but in reality the power is mediocre in first and second gear and you really need to hold those lower gears a while to get the Jeep up to normal traffic speeds. 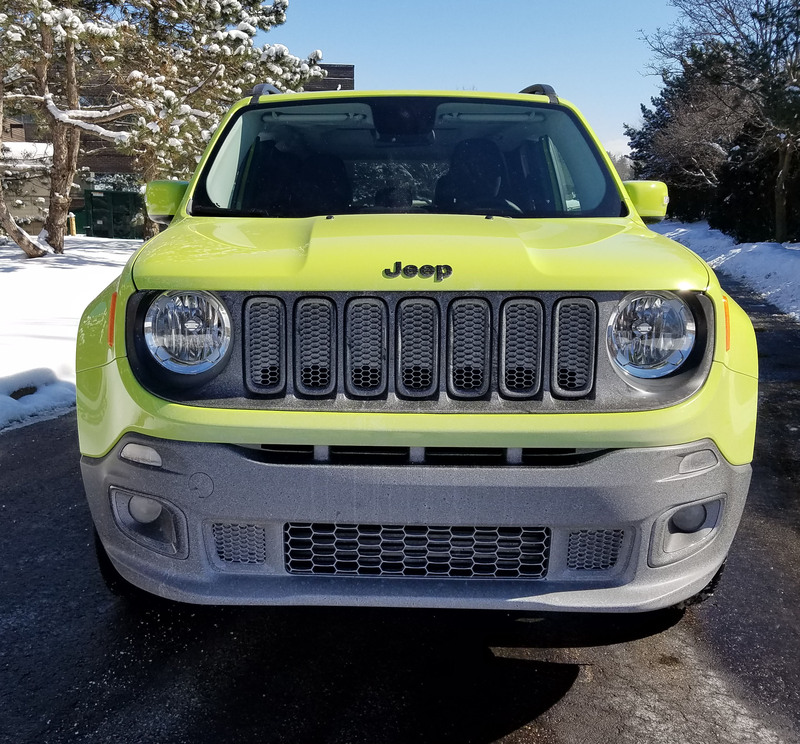 Of course one of the big selling points for Jeepaphiles is that the Renegade looks boxy, much like other Jeeps, with a 7 vertical-slot grille and round headlights. In back though it features funky X-shaped lenses on the taillights that look like cartoon characters eyes that have been X-ed out when they are dead. Then again, you don’t have to look at those while you’re driving, only the folks behind you do! Inside the Jeep is nothing fancy, but everything is easily seen, found and used. Seats are black cloth and the dash is black and textured on top with a smooth black facing and matte black trim around the screen. Door releases have a chrome finish as does the gear shift ball. The thick leather steering wheel is a manual tilt/telescope number with cruise, trip computer and phone buttons on its hub. The Renegade also has automatic lights and adds push-button start this year. 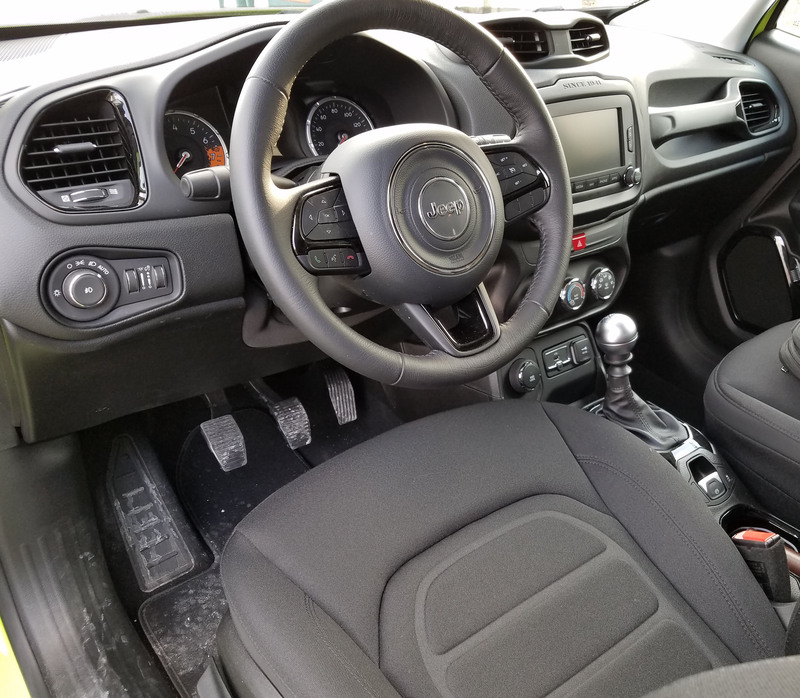 Jeep’s shifter is easy to use and includes an automatic parking brake. It deploys every time you put the Renegade in Park and can only be released after you put your right foot on the brake and your left foot depresses the clutch. Pull the small brake tab on the console up and you’re ready to go. The dash is clean with good gauges and a modest 6.5-inch screen, which is an upgrade from the standard 5-incher. 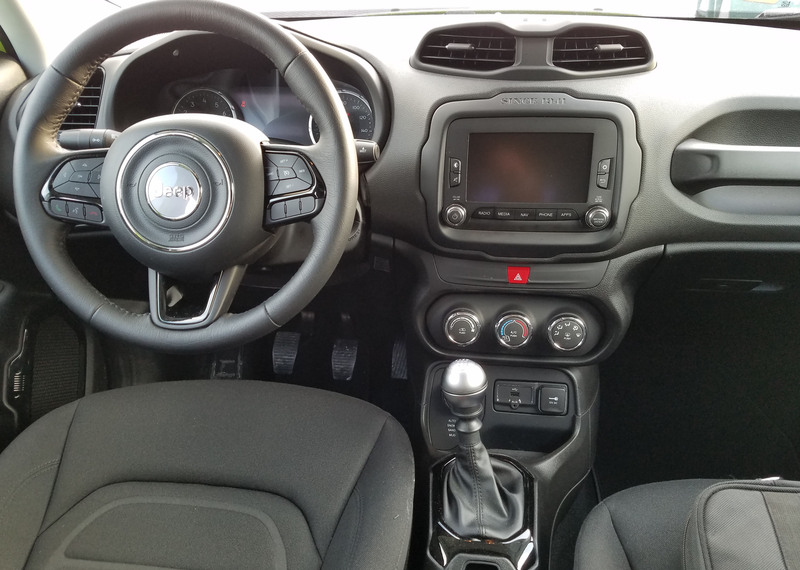 The navigation group costs $1,345 extra and adds that larger screen, plus Fiat-Chrysler’s Uconnect infotainment system, including an HD radio, satellite radio and Sirius XM Traffic and Travel channels. Engaging and using the radio via the screen is simple and navigation is easily readable. Below that are big climate control knobs that also are easy to adjust, while overhead is the My Sky sunroof system. It adds $1,495 to the price and includes two sunroofs. A key must be used to unlock the panels that then can be removed, fully exposing the occupants to the outdoors. This is very Jeep friendly, but also requires more work than most sunroofs that usually require nothing more than sliding a sun shade backward. Still, Jeep wants to create an outdoorsy feel. Just be sure to store the panels in the cargo area, in case inclement weather blows up in a hurry. 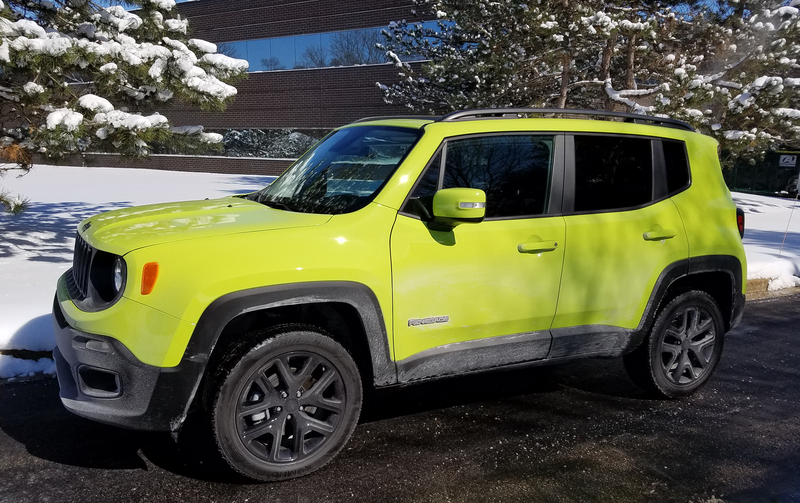 The Renegade’s interior is mostly quiet and comfortable, but there is some road noise on the freeway and a bit of wind noise from the rear sunroof when driving at highway speeds. Also note that the big boxy look means the Renegade has massive A-pillars that can block some side to front views. You notice it most when the Jeep is sitting at a corner waiting for traffic to clear before crossing an intersection. Seats are comfortable and provide good support via both the top and bottom cushions. These are manually adjusted and I found I’d like the front seat edge to tilt down a little more than it is able. A pump handle on the side helps get the driver to the proper seat height though. Head and legroom are good front and rear, the boxy shapes creates mucho headroom. Storage behind the rear seats is generous too at 18.5 cubic feet. That grows to more than 50 cubic feet when the rear seats are folded down. There also is a cushion on the cargo area floor, which would be welcome by any canine or other critter along on a trip. Gas mileage was better than in any Jeep I’ve driven. The turbo engine not being too strong has this benefits. I got 27.2 miles per gallon in a mix of city and highway driving. The EPA says to expect 24 mpg city and 31 highway and the Jeep features a capless fuel filler. Renegade’s pricing is attractive, the base Sport model listing at $19,070 in front-drive and $21,090 with AWD. Note the Sport has no air conditioning or Bluetooth, but then you’re probably a rugged outdoorsperson and won’t need either, even in the city. Other trims, from bottom to top, include Latitude, Altitude (tested), Limited and then Trailhawk and Deserthawk, the latter two aimed at more serious off-roading. From Limited on up the engine grows to a 2.4-liter I4 with 180 horsepower and uses a 9-speed automatic transmission instead of the manual, which is only available with the turbo model. Base price on the Trailhawk is $27,990 and this model includes skid plates and tow hooks, while the Deserthawk lists at $29,485. Both models feature 8.7 inches of ground clearance, up from 8 inches in all other models. As for the tested mid-range Altitude, it starts about $24,500 and this one ended up at $28,025. That’s still relatively modest for an AWD model with a fair amount of features. Jeep’s Renegade really seems to have something for everyone in the entry-level AWD, rugged vehicle market. Just don’t plan to go mudding or way off road unless you buy one of the upper end hawk models. Hits: Good ride and handling plus 4WD and still looks like a Jeep. Big climate control knobs, two sunroofs, and economy pricing. Misses: Mild power and big vision-blocking A-pillars, sunroof panels must be removed, some tire road noise and ugly X-lens taillights.